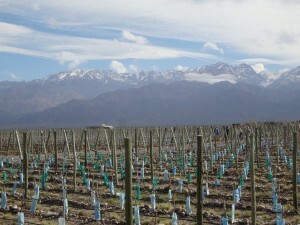 The Andes Mountains provide a backdrop to Mendoza’s winter vineyards. wind, was why I hadn’t instead re-visited Napa. But I had heard so much about the merits of this extraordinary wine producing region surrounded by the magnificent Andes Mountains that it warranted a visit to Mendoza. With more than 900 wineries to choose from, my companion and I needed to narrow down our itinerary. So in northern Argentina’s late winter we journeyed to the Valle de Uco. 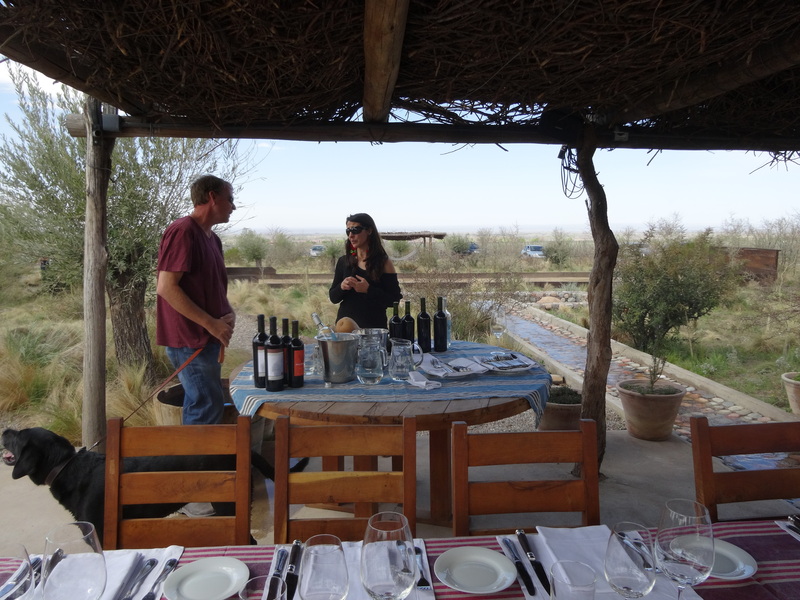 Wine hopping in Mendoza is unlike the California wine experience. We needed to consider the distance between wineries, the questionable road markings and that many bodegas require advance reservations. We settled on visiting three very different vineyards and fortunately, with a good map, we had no trouble in finding our destinations. A few glitches arose along the way, including the Zonda, but this was an adventure and we weathered the storm which blew us into our first stop. Bodega La Azul, fronted by a small rustic building which turned out to be a restaurant, served one of the best meals we feasted on in Argentina, and for that matter, anywhere. Chef Jimmy Baeza, who recently opened his own restaurant in the city of Mendoza, served up a sumptuous five course gourmet lunch accompanied by the delicious wines of La Azul in a comfortable, homey setting. The entrée selections featured huge thick cuts of tender braised pork, a grass fed Argentine rib eye or grilled chicken with a tangy lemon reduction. My companion, who I know as a vegetarian, broke all the rules and went for the rib eye and had no regrets. Our Brooklyn-raised waiter, Pablo, a close friend of the owner of this boutique winery, Ezequiel Fadel, related its history as he poured accompanying glasses of La Azul’s memorable premium Malbec, Cabernet Sauvignon and Merlot. Following lunch, pleasantly full and a bit lightheaded, we strolled back to the small but technologically advanced bodega where, at a small wine bar, our waiter re-introduced us to the exceptional wines that accompanied our meal including the special Grand reserve of which only 3.000 bottles are produced annually and never exported. 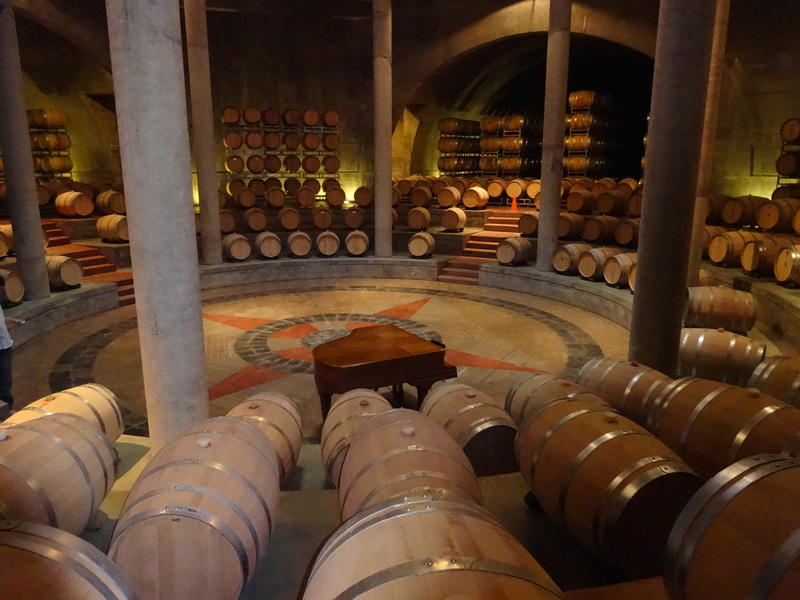 During our tour, we enjoyed the rare opportunity to taste the best of the best wines directly from the aging barrels. Following a welcoming and delicious beginning to our discovery of the Uco Valley, we bid Jimmy “adios” and headed towards our next stop. The heart of the Salentein Bodega. 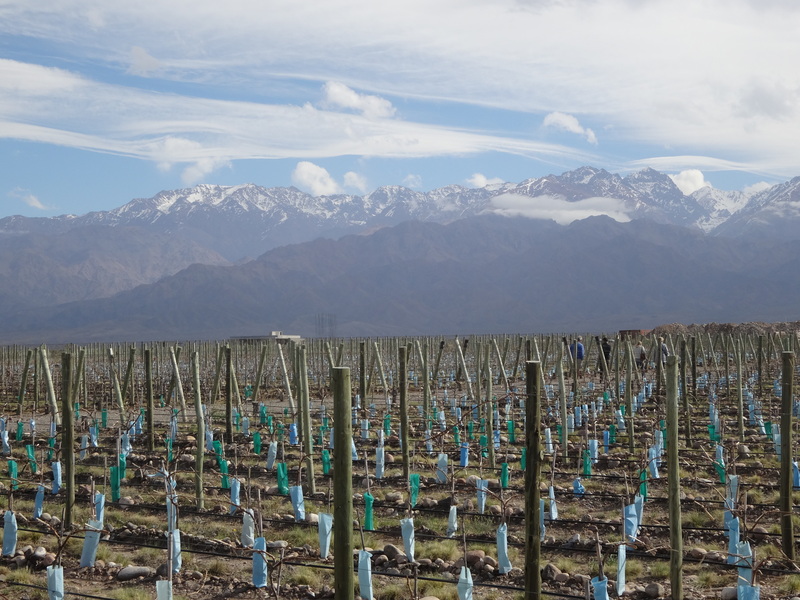 At the opposite end of the spectrum the Salentein winery, producers of more than 1.6 million liters of Mendoza wines, own three vineyards, each at a different altitude. The buildings on the main “campus,” conceived by two then unknown Mendoza architects, Bormida & Yanzon, thoughtfully designed attractive, functional buildings minimizing the impact on the environment, respecting the landscape and the grandeur of the Andean backdrop. The architects used only materials native to the Uco Valley to build the Salentein project. We ambled up a path toward a one story modern state of the art gray building admiring the contemporary statuary on either side. The building housed a large wine bar surrounded by comfortable sofa seating, a restaurant and contemporary art gallery. This thirteen year old first class operation founded by Dutchman Pon Mijndert named the winery after a castle in the Netherlands. A short walk through the vineyards took us to the two-level heart of the operation. The ground level housed gleaming stainless steel tanks and French wooden vats for fermentation and storage. The second level, constructed underground, kept temperatures cool with no need for air-conditioning. Filled with giant oak casks for aging the wines, the practical design allowed liquids to flow from the tanks on the ground floor to the barrels on the underground floor by the traditional gravity system. We came across a surprise feature where the four wings of the cellar converge: an acoustically perfect circular chamber resembling an amphitheater with a grand piano set to one side. There, Salentein regularly hosts classical concerts and tango dancing. Participants and audiences sit at the edge resting comfortably against the giant wine barrels. No doubt those who attend these events also partake in the wide selection of Salentein wines. In the elegant tasting room we sampled goblets of fine Chardonnay, Pinot Noir, Merlot and of course the region’s famous Malbec. The nearby Primus Room, we learned, houses Salentein’s premium wines produced only during the years when grapes are of exceptional quality. This bodega, almost like a Hollywood movie set, stands as a shrine to sustainable building and wine making. 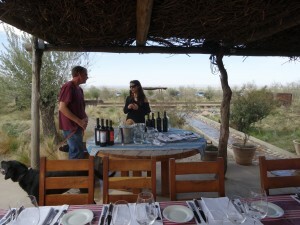 Preparing for lunch and “home grown” wine at the ramada of The Vines. logo marking the entrance to our final stop, The Vines of Mendoza. This unique property features private vineyard estates of three to ten acres and a newly opened resort and spa. Oenophiles who have dreamed of having a vineyard of their own and personally blending wines to suit their own tastes have discovered “paradise found” at The Vines. We drove several minutes through acres of vineyards, each parcel marked with the owners name and amount of acreage, until we arrived at the heart of the operation where the fruit of the vine turns to wine. The co-owners of this project, American Michael Evans and Argentinian Pablo Gimenez Riili, discovered a mutual passion and set out to create some of the world’s finest wines while offering a special opportunity to wine lovers to create their own special blends. Neophyte vintners from all over the world including the United States, Canada, Brazil, Argentina, Ecuador, Australia, the UK, Ireland and Switzerland currently participate in this unique, professionally managed project. In 2012, the amateur vintners created 230 unique wines at The Vine using 18 different varietals. We were privileged to participate in the blending process of a new wine with an Orange Country, California family under the guidance of Wine Director Mariana Onofre who tutored us in the proper series of tasting, spitting and cleansing the palate. We moved on to discovering the clarity, tannins, acidity, finish and nose of each blend all leading to the final decision for another personalized addition to The Vines distinctive wines. All the while, at the bar behind us, which had been transformed into a laboratory, Head Wine Maker Pablo Matorell, methodically mixed in just the precise amount of this varietal and that based on the discussion of what we had just sampled. Some of The Vines vintners create their own wines for personal use while others market theirs through their own fine dining establishments throughout the world. Not only does The Vines offer a dream come true for aficionados of “the grape,” but it also fills the bill for gastronomes. Executive Chef Diego Irrera oversees the unique Argentine style cooking and presents memorable and tantalizing dining experiences. We joined a small group at the ramada, an open-air covered dining area, overlooking the snow covered Andes Mountains for a sumptuous luncheon. The grills blazed and the tender Argentine grass fed beef sizzled while we sampled various vinos. A picture-perfect multi-course lunch followed featuring various cuts of meat, fresh vegetables, luscious desserts and of course more of the delicious very locally produced wines. Lots of tasting continued throughout the lunch and we celebrated a Chicago couple as they selected the final label design for their new, recently bottled wine. The Vines Resort & Spa recently opened amidst the vineyards featuring a boutique lakeside resort with luxurious villas, a wine and cocktail bar, gym and spa appropriately including vinotherapy treatments, a swimming pool and a variety of outdoor activities from wine-making to yoga to horse back riding through the vineyards. The Vines of Mendoza presents a true escape with all the trimmings in Argentina’s remote Uco Valley. For a real change of pace and attitude, the bodegas of the Uco Valley of Mendoza present a unique, hospitable, relaxed and memorable experience in one of the world’s finest wine producing regions. It’s a bit like California’s wine country a half century ago. Our adventure introduced us to the beauty of the Uco Valley, its acres of vineyards set against one of the most magnificent mountain ranges in the world. No traffic, friendly people, delicious dining experiences and some of the best wines produced anywhere. Experiencing Argentina’s extraordinary wine country created special memories and a greater appreciation of the allure of wine tourism.